WHEN THE yacht Morning Light crosses the finish line of the Transpacific Yacht Race in July, its crew may see a familiar sight to welcome them "home" to Hawaii -- the orange sails of the Hokule'a. Nainoa Thompson, Polynesian Voyaging Society president and Hokule'a navigator, told the Morning Light crew yesterday that the traditional Hawaiian sailing canoe might be able to greet them when they complete the grueling 2,225-mile crossing from Los Angeles to Honolulu. Thompson's offer came after hosting the Morning Light crew aboard the Hokule'a Friday and yesterday, instructing them in some ways of traditional Polynesian sailing. The two-woman, 13-man crew of the Morning Light, with an average age of 21, hopes to become the youngest crew to complete the Transpac race. They were selected from a field of 500 applicants to race on a boat owned by Roy Disney, the 77-year-old nephew of Walt Disney and a yacht-racing enthusiast who hopes to pass on his love of the sport to a younger generation. Disney also plans to make a documentary film about the Morning Light crew's training and the race. 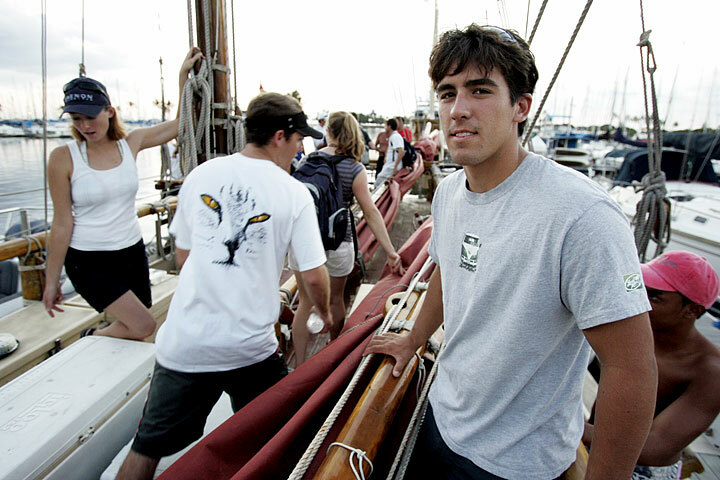 Kaneohe resident and Punahou School senior Mark Towill, 18, is the youngest crew member and the only one from Hawaii. The crew includes 13 members from the mainland and one from Australia. Yesterday they helped sail the Hokule'a from Rabbit Island on Oahu's Windward Side to the Waikiki Yacht Club. On Friday they sailed south, as if going to Tahiti. Their return to Oahu was completed in the dark, to give them an appreciation of wayfinding using stars. On yesterday's sail, Hokule'a got up to only about 6 knots (about 7 mph), estimated Morning Light crew member Jesse Fielding, 19, of North Kingstown, R.I. But the double-hulled canoe "has a totally different purpose" than the high-tech racing yachts that can hit 25 knots (about 29 mph), he said. "This boat was designed to explore and voyage," Fielding said. Though the young sailors spent only a few days with Thompson, "we learned so much," said Jeremy Wilmot, 20, of Sydney, Australia. "I hope to become a better sailor from being with him," Wilmot said. "He was very inspirational." Fielding agreed. "From the first moment he (Thompson) started talking, you could feel the great amount of personal energy he invested in sailing." Though the modern and traditional boats are different, "the knowledge is very parallel," Fielding said. Thompson "can appreciate what we're doing. And we greatly appreciate what he does. It's a mutual bond." 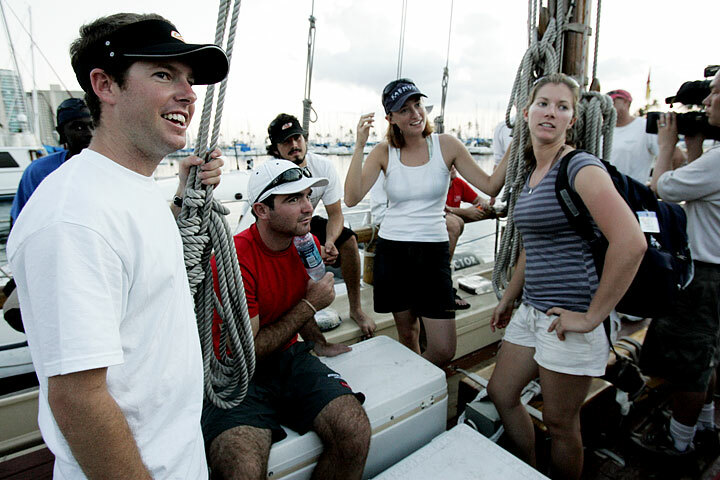 Inspiring young people through sailing is a common theme for Thompson and Disney, who met for the first time in Honolulu in September. "You're all smart and you all love learning," Thompson told the Morning Light sailors after their second day on the Hokule'a. "I hope this canoe and this experience go with you." Thompson encouraged the sailors to think of their race as coming home to Hawaii. "I'll be watching you with admiration and a lot of envy, since your boat will be going three times as fast as ours," he said. He encouraged the group to move from being a team to being a family as they train together. The group expects to train in Hawaii for several months next year in preparation for their race. Meanwhile, the Hokule'a is scheduled to make a historic sailing voyage of 7,000 miles to Micronesia and Japan. In Micronesia it will deliver a gift sailing canoe, the Maisu, to Mau Piailug, the navigator who guided the Hokule'a on its first voyage to Tahiti in 1976 and who taught Thompson the art of non-instrument voyaging. Morning Light crew member Steven Manson, 21, said he had been sailing only a few years and was in awe of his crewmates, some of whom have been sailing since they were babies. Waimea McKeague, 16, has been sailing on the Hokule'a for several years as part of the Kapu Na Keiki group, and was aboard yesterday with the mainland yacht racers. "They caught on real fast," McKeague said.